VOTE TRUMP. HRC is DEFON 2. Immigration is the only issue that matters. Absolutely must listen to what Ann Corcoran has to say here. Hillary’s Michigan, America’s Worst Nightmare Must listen. Clinton. Pass to any undecided friends via FB, Twitter, etc! election makes all of his sacrifices meaningless. Hamas-linked CAIR enraged that sheriff’s office hosting seminar on jihad threat. 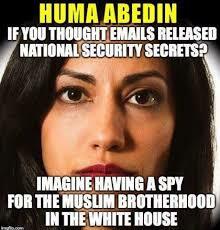 connected to Huma Abedin and her parents. civil rights and advocacy organization. Video from outside courthouse after the verdict. Is Lying, Donald Trump Is Way, Way Ahead Of Hillary! The Chinese would call for the men in white coats. TRIAL – All Stories pertaining to this issue.